Community Harvest Project relies on soil-moisture monitoring to optimize drip irrigation. The Community Harvest Project in Grafton, MA, is a non-profit, volunteer-run working farm that donates 100% of all produce to hunger relief organizations within Worcester County. In 2014, CHP was able to provide 1.1 million servings of fresh fruits and vegetables to those in need. An early adopter in terms of using automating irrigation using soil moisture monitoring, CHP is now using the IAS XR3000 with the RF90 wireless sensors to manage their multi-zone drip irrigation needs. Soil moisture sensors in each drip irrigation zone, report back a percentage of “wetness” to the central XR3000 controller in the pump house. 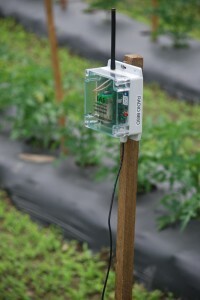 CHP can monitor the relative soil moisture content and choose when to irrigate a particular zone, or automate the process thru setting on/off thresholds for each zone.The attached Vegetronix VH400 sensors use transmission-line technology to determine moisture content surrounding the sensor probe. The XR3000 is shown here mounted in the Brigham Hill pump house using the original wall panel from the original automation system. The final mounting will be a two enclosure solution with no external wires or relays.The second enclosure will provide LED indicators for displaying pump and valve activity as well as switches for manual actuation. This enclosure also terminates the XR3000 wiring harness so the only customer wiring required is to wire in each of their two-wire irrigation devices such as valves and pumps.